Cable Account is one of the most useful software to cable operators in organizing daily tasks from new subscriber profile to pay channel maintenance within built in customer billing system facility. Send updates to customer by SMS regarding pending balance or collected amount or greetings etc. You also can keep update your customers for billing by SMS. Solitary platform for numerous services like DVR/VOD/PPV/VAS, etc. and networks like COAX/FTTH/HFC, etc. The system is developed on modular design, so clients have the capacity to pick diverse modules and interfaces as per their own needs, or request for devoted modules and interfaces to accomplish consistent converging with their existing systems. Meantime, we could also incorporate client's office automation system; hardware and program management system onto a unified platform, with essential re-design for system consistency and safety as a whole. The system is based modular design, so that customers can prefer various modules and interfaces in accordance with their own requirements, or request for devoted modules and interfaces to achieve bug free merging with their existing systems. Finger print will print message on screen with card no, STB no, and message. BMS puts the genuine power of community processing at the heart of your broadcasting business. This interesting solution has features that will streamline the working of advert insertion request management, activity and credit control offices. CIO|365TM has effective reports that give convenient MIS empowering the management to take informed decision. Keep up the points of interest of clients and business contracts in a solitary interface. Booking and planning of advertisements is taking into account levy card or rate agreements. The CIO|365TM BMS makes project diagrams utilizing wizards and algorithms. The framework coordinates with all driving playout systems. It has effective records receivable and credit control framework that gives client ledgers and ageing analysis. CIO|365TM BMS can be arranged to shoot out automatic updates. The top management has access to dashboards that give penetrate down MIS diagrams and reports. You can get your own channel management software from Aplomb Technology that will help you to watch on your revenue from advertisements. We provide best solution in channel management software which is having advertiser management software; advertise accounting software, cable station management software and advertising billing software. 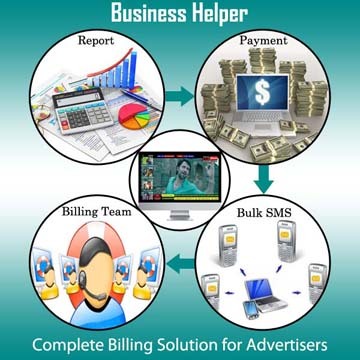 The Business helper – an advertising billing software will manage and track your profit in advertisement industry from assorted sources. Aplomb Technology has developed advertising billing software to decrease the time of preparing billing on paper. This software is really very helpful in managing numeric tasks like advertising report management, financial account, advertisement scheduling and more on the sole platform.